I have been super lucky to have taken pictures of Abby for a few years. I have also done her older brother’s senior pictures AND her older sister is one of my Class of 2019 Spokesmodels! I can’t wait to get to know Abby better. If there’s anything I’ve learned through shooting the last 11 years it’s that siblings are typically really different. Only once have I had siblings want the same location. Abby’s Senior Session this summer will NOT be a let down, I’m sure! Bella is wonderful! She was officially my first TEAM 2020 girl and I was so excited I almost peed my pants! She has the most stunning eyes and is as sweet as they come! Here’s to several more shoots together, cutie pie! I can’t wait!! These girls! Ugh! They’re AMAZING!!!! I am BEYOND thrilled to have them as my TEAM 2020 girls. They are the face of my company for the next year. They will be getting to know me reallllly well as we spend time together not only at their personal senior sessions but also at some killer bonus sessions! I adore my group of Spokesmodels each and every year and this coming year won’t be any different! Here’s to a killer Class of 2020!! 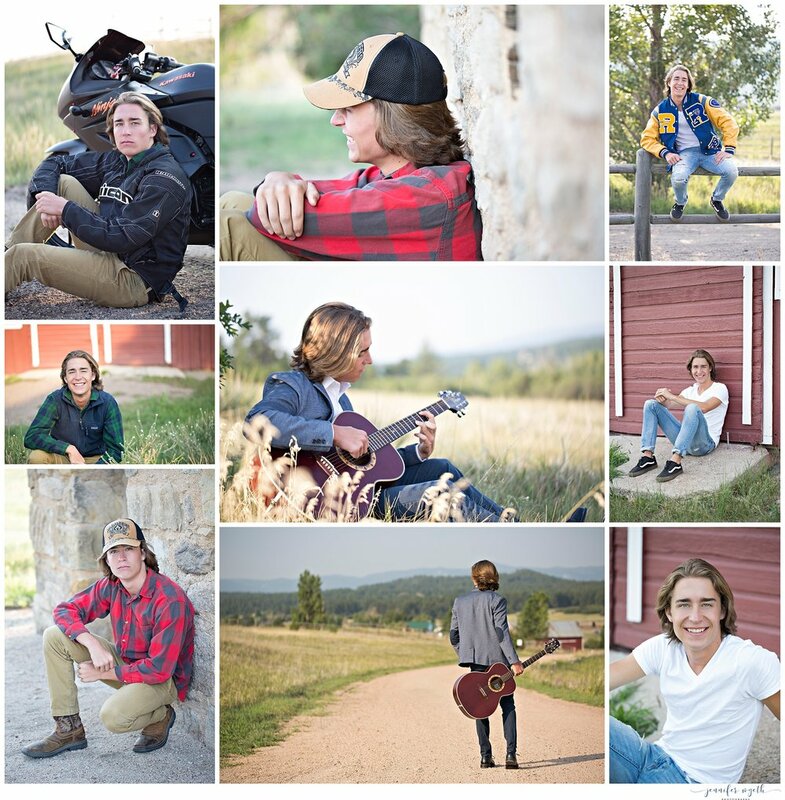 Click HERE to contact me and get more info on having YOUR senior pictures done by me! I loved the adorable bright red lip that Maddie chose to put on for her individual Christmas pictures. Her fun personality always adds some spice to any situation. She’s just so cute with a healthy dose of sass (in a good way!!!). I loved how Kelly’s Christmas pictures turned out! They’re just darling and show off her cute personality. The Santa hat and the mug?! Just icing on the cake!! I loved the PJs that Shanwna went with. They’re really cute and the red looks amazing on her. Her pop of red lipstick and her soft curls completed her Christmas-y look!! So cute, right?? Esmeralda came out here all the way from Kansas for her senior pictures. Her mom, dad, and older sister even tagged along! Her parents are from El Salvador (so cool!!) and said that Cheyanne Mountain reminded them of home! Who knew!! Esmeraldas pictures turned out so stunning. The light was amazing and she was absolutely breathtaking! Ethan’s shoot was so full. Just that. Full. We had his motorcycle, his grandfather’s gun, and his guitar. The morning was so beautiful and I’m so happy we were able to include all of his loves. He’s such a fun guy who loves to laugh and is very much a deep thinker. Plus I photographed not one but two of his sisters. LOVE this family!! I’ve knowns Hunter’s parents for years. We have even vacationed together (take me back to the beautiful beaches of Mexico!!). 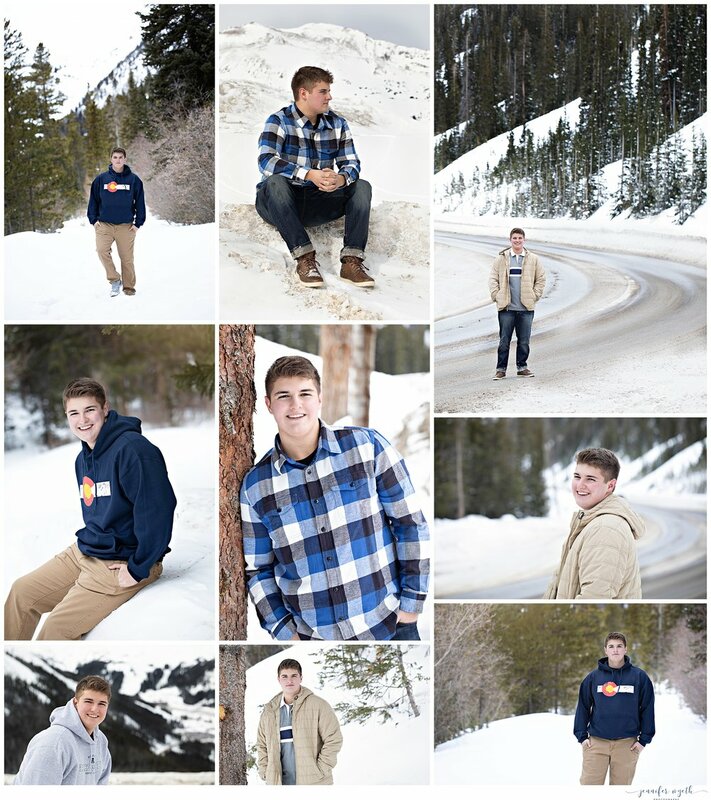 But I haven’t ever spent time with Hunter until his senior session. At first he was simply putting up with us mamas. But by the end of the session he was excited for the ordering session and super excited to see and pick out all of his images. I call that a serious win!! I knew Elizabeth wanted something really special for her session. She had mentioned she wanted nature AND something fun and funky so I suggested the RiNo Art District in Denver. That place did NOT disappoint. Every direction you turn is a new look and a new fun wall. I could have shot there allllllll day long! I love it when my girls are up for something new and different. And I LOVVVVEEEE it when they trust me! For Kelly's shoot we headed out to the Paint Mines in Calhan. It was worth the hike! I was so glad she braved the early morning with me because we had thunderstorms NON STOP for a few weeks straight. It would have been super stressful and her beautiful curls would have been toast! It was such a great morning!! Loved every moment I spent with Kelly and her darling mama. This beautiful girl came all the way out to sunny Colorado Springs for her senior pictures from Kansas. She wanted a different look than all of her friends and I think we delivered. She was exceptionally sweet and so appreciative. I LOVED spending my morning with her. Hopefully she had as much fun as I did!! P.S. Yay for another successful morning shoot! The week of Monica's pictures AND the following week were jam packed full of afternoon storms! 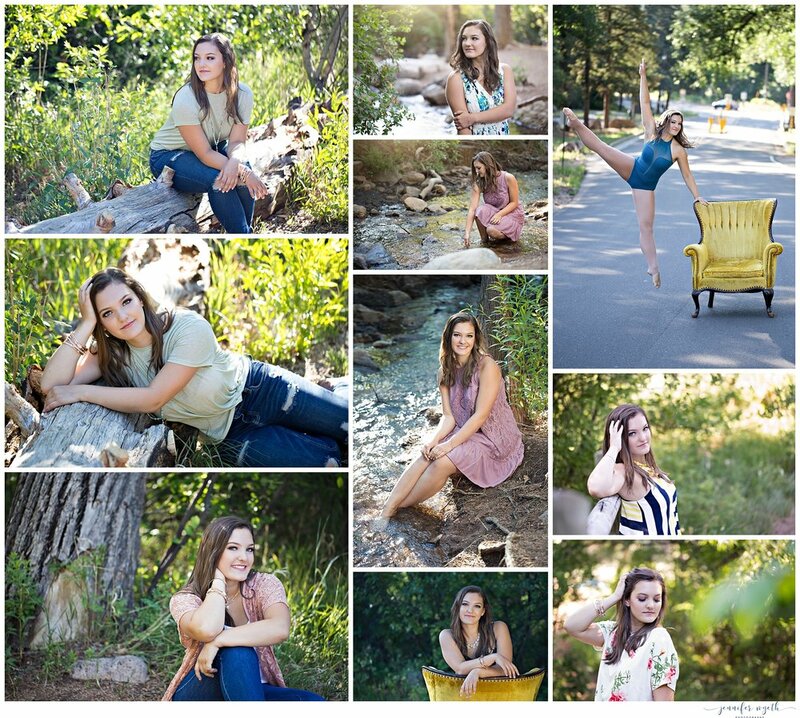 Elise flew out for her senior pictures from Oregon. She wanted the Colorado feel and since I did her sister's pictures a few years ago it only seemed natural. Speaking of natural, have you ever seen such a natural beauty?!? Every picture was complete perfection!! Plus, I've known her forever... ok not quite THAT long but for sure since she was in braces and much much shorter. It's been amazing seeing the beautiful and kind young woman she has become. Natasha is so darn cute! She drove 12 hours to get to me from Missouri for her senior pictures. We had beautiful weather and so so so much fun! I loved watching her dance in the middle of the street and hearing about the 25 schools she has toured while trying to decide where she is headed next year... I mean, a dancing business major needs to be picky! Thank you, Natasha! I adore you!! To say this cute boy is a crack up and goof ball is an understatement. He is a BLAST! He is, hands down, one of the happiest humans I have ever met. And he plays the guitar amazingly. (Look out ladies!) One day, hopefully lots of years from now, he will make some girl very very happy and keep her laughing for the rest of their lives! 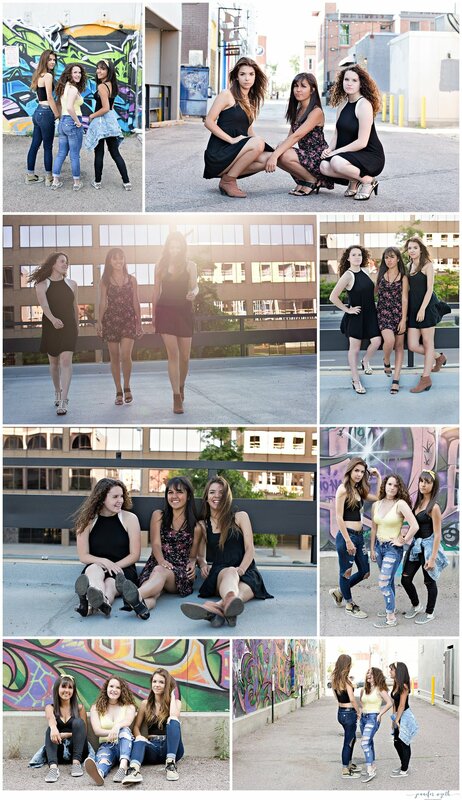 Ryann was the lucky winner of a free mini session with her best friends from my make-up night last month. We had so much fun at her session and I feel so lucky to have met her and her two besties!